This series magnetic tool, products is used for the manufactory that produces plastic injection produces with Smaller batchs, quicker delivery times and "just in time "delivery force the supplier to more frequent tool/mould change. With its high energy magnets the EPPLC system ensure an absolute safe application in injection moulding machines due to a homogeneous and concentrated flux through the base plate of the mould. 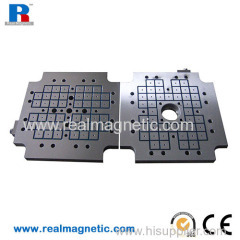 Electropermanent magnetic system ,utilizing high energy magnets, will not be affected by electfic power failures .due to the monoblock-steel-construction the platen shows highest possible rigidity. Modlar designed systerm with limited construction height. Electronic pole-reversing control unit with safety feature. Poles separated with brass, ensuring high wear resistance. 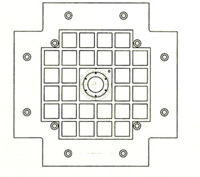 This control is especially designed for the complete magnetizing and demagnetizing cycles of the magnetic platen. Also suitable for exchange of existiong controls. Using the EPPLC system tool change times of just a few minutes can be achieved. This seies were produced accrding the customers request.